The Ramelau mountains of East Timor (more than 30 million years old) have great significance as the home of the spirits and souls of the ancestors. In the local language (Mambae) the country’s highest mountain, Tatamailau, is tata (old man) mai (oldest man) lau (most older and first). Timorese from all over the country come here every year on 7 October to thank god and have happy thoughts.This Ramelau region was originally a huge eucalypt forest which the Timorese were frightened to enter. In 1927 the Portuguese organized people into the district to set up farms.Following their invasion of East Timor in 1975, the Indonesian military ordered the people to move to the areas near the town. 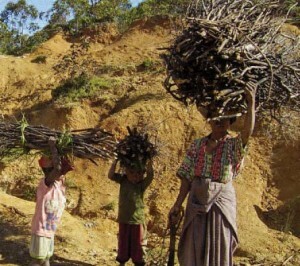 As the forest was a Falantil stronghold the Indonesian military forced the people to clear it. Open fighting between Falantil and the Indonesian military continued up until 1984 when Falantil tactics changed to clandestine guerrilla operations.The farmers grow vegetables, mainly potatoes, using an unsustainable technique: slash, burn, and move on from exhausted soil. Severe soil erosion and major land slips resulted. A tree planting project has begun with limited funding, to assist revegetation the grazing buffalo are now being tethered with a rope to allow the seedlings to become established. Many of the people are now moving back to live on their former remote hillside farms where they can grow crops for most of the year due to the mist and rain. From Dili a three to four hour drive south takes you to the central Timor hill town of Maubisse (1400 meters) in the northern foothills of the Ramelau mountains. Opposite the market is a good restaurant for lunch. The journey will take a little longer if you use the regular daily long distance bus service along the main road from Dili. From Maubisse if on foot, either take a local truck (not many and you may have a few hours wait) going to Hatabuilico, or catch the long distance bus and ask them to stop 10km south on the main road. (Look for a bitumen road that turns off sharply to the right ) If you get to the top of the range and see a Telcom tower road on the left you have gone 1.6km past the turnoff. This broken bitumen road to Hatobuilico 8,52’40”S 125,35”30”E is not suitable for conventional cars it winds west through eucalypt woodland, hamlets and vegetable gardens at 1800 to 2000 meters elevation.Travel along this road is by four wheel drive or local truck (there may be a few hours wait for a lift.) The 18km takes one to one and a half hours. This road was being reconstructed in late 2017? 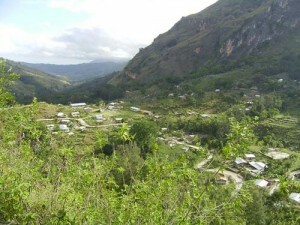 A beautiful hillside and ridge town at almost 2000 meters is surrounded by high mountains. The Alecrim guest house run by Alexandre Araujo, his wife Adelaide Barroi and children is 800 meters north of the police station on the low side of the road with the school and soccer field below. The family live next door above the market. Alexandre was district superintendent of education. He speaks Tetum, English, Indonesian, Portuguese and Mambae. ( He is a goldmine of information.) The guest house can accommodate at least twelve people. Tariff is $20 per night and for a little more all meals can be provided. Alexandre can organize a guide for about $20 per day plus all costs. A pony and attendant costs $20 per day extra. Alexandre’s phone number is +67077304366 or mobile +67077258978 If unavailable please text. There is a new hotel/guesthouse situated on the left side of the Hatobuilico road just before the town, Ovalido Garden. +0677413486 +0677432000 as of 2014 the mobile phone service works well in most of Timor Leste. Anne and Fiona from the Blue Mountains near Sydney, have written a guide to some other high country walks centred on Hatobuilico, including details of guesthouse stays. It would be easy to spend a week in this beautiful area. There is also a short informative vidio on there blog at; hatobuilico.wordpress.com Also lots of information at; www.hatobuilico.com a web site of the local community.